Summary bet365 Live casino shares the Playtech European and Asian feeds with a number of other Live casinos (eg betfair and Dafa888) and offers Sic Bo alongside Roulette, Baccarat and Blackjack. As with the other Playtech casinos, the emphasis is on offering welcoming environment for players looking to try live dealers for the first time. Table limits are comfortably low (starting at just 25p) and bet365 offers lots of tables, so there's no need to wait for a seat. 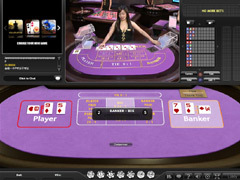 Comprehensive statistics and game history are available in small windows, and players can interact with the dealers and other players via live chat. A nice touch at bet365 is the option to play a mini-game whilst playing the main Live game. These mini games run in a small window to the top left of the screen and you can choose Blackjack or slots. Once players are comfortable with the Playtech live games are are looking to play for higher stakes, they may prefer betfair - which offers a maximum table limit of £1,000 on Live Sic Bo. Available tables bet365 offer 178 tables so getting seated should not be an issue. Game speed Each game takes an average of 56 seconds, giving up to 65 games per hour. Summary bet365 uses both Asian and European dealers on their many tables. There is a good variety of games on offer and Baccarat players should have no problem finding a table to suit. Versions Classic and Unlimited with both European and Asian Dealers. Summary With 12 tables available throughout the day, players should have no problems getting seated at bet365. The choice of either European or Asian dealers gives players a different flavour of the game. Table limits Minimum £0.25, Maximum £25. Available tables bet365 offer 5 tables thoruohout the day. Summary bet365 offer the fastest games online. They also accept low minimum stake bets which allows the more social bettor to participate. Table limits Minimum £5, Maximum £200. Available tables bet365 offer 1 Live Dealer Sic Bo table. Game speed Each game takes an average after 90 seconds which includes 30 seconds to bet, giving 40 games per hour. Summary Sic Bo at bet365 is aimed at the mid roller market with stakes set accordingly. One feature of game play here is that players can play other games at the same time via the mini games window in the top left of the screen.